The great wines of the world are expensive and often hard to find. They are also, in many ways, unmistakable—in much the same way a movie star is instantly recognizable on-screen, the stars of the wine world are (or should be) instantly recognizable in a glass. At the same time, part of what makes a great wine great is how well it expresses something larger than itself: the region of origin, the grape variety or varieties, the character of the vineyard, the tradition behind the wine. This is why it is possible to find—if you look hard enough—affordable wines that echo the characteristics of the truly extraordinary. A terrific $15 Côtes-du-Rhône from an obscure property (or even from a well-known property) may never achieve the complexity, depth and nuance of a top-level Châteauneuf-du-Pape, but at the same time it can offer a hint, or more than a hint, of what that much more expensive wine from the same general region is like. Similarly, a superlative Australian Shiraz may offer far more richness and intensity than a very good $15 bottle, but at the same time the two wines may share certain flavors: ripe blackberries, say, with a subtle vanilla note from the oak barrels that both were aged in. One trick for finding these bargains is to hunt for famous grapes in unsung bottlings. In Burgundy, for instance, grapes from grand cru or premier cru vineyards are occasionally "declassified" when their quality doesn't quite live up to expectations. But when those grapes are blended into a basic and relatively inexpensive Bourgogne Blanc, the quality of the lesser wine can go through the roof. (Visiting the Web site of a good producer—or even better, a good importer—sometimes provides this information.) Keeping track of current trends also helps. In Bordeaux, for instance, thanks to ambitious investments and attention from some of the top winemakers in the world, formerly disregarded regions such as the Côtes de Castillon, Fronsac and the Côtes de Blaye are now producing surprising numbers of high-quality wines that capture some of the qualities of the most revered Bordeaux bottlings, and they're priced without the upcharge that more illustrious regions ask for. And noticing when a winemaker or winery famous for making world-class, cult Pinot Noir, say, starts a new, affordable brand as a side venture is always a good strategy. For this story I chose 11 world-class wines, tasting their current vintages to make sure they lived up to bottlings I'd had in the past. I then tasted a wide selection of affordable wines from the same regions, in the end tracking down stellar, under-$20 matches. STAR: 2003 Weinbach Cuvée Ste Catherine ($50) Domaine Weinbach, one of Alsace's benchmark producers, is known for powerful, complex Riesling that can age for years. For the round, stoney Cuvée Ste Catherine bottling, grapes are picked toward the end of harvest from the lower section of the Schlossberg grand cru. STEAL: 2005 Paul Blanck Riesling Classique ($19) The Blanck family has been harvesting Riesling in Alsace since Hans Blanck bought his first vines back in 1610. Today they make a broad range of wines, from high-end grand crus down to this peach-inflected white, which has mineral notes that echo those in the more expensive Weinbach. STAR: 2005 François Cotat Les Culs de Beaujeu Sancerre ($45) Anyone who thinks of Sauvignon Blanc as thin, sharp wine should taste François Cotat's Sancerres. From the tiny Loire village of Chavignol, Cotat produces voluptuous, exotic whites with honey, pear and citrus flavors. STEAL: 2005 Henri Bourgeois La Porte du Caillou Sancerre ($18) From a family that's been making wine in the Sancerre region for 10 generations, Bourgeois's La Porte du Caillou has more of Sauvignon's traditional cut-grass notes, but its ripe grapefruit flavors hint at the richness of the Cotat. STAR: 2004 Domaine Leflaive Puligny-Montrachet Clavoillon 1er Cru ($114) Leflaive, a great name in Puligny, makes some of the world's best Chardonnay. Doubt it? Invest in a bottle of this spicy, earthy, tremendously complex white, so full of energy that it seems to vibrate on the palate. STEAL: 2005 Domaine Hubert Chavy Bourgogne Blanc Les Femelottes ($18) Earthy notes appear here, too—the vineyards this wine comes from are located on the same hill as Puligny-Montrachet, though lower down the slope. Green-apple fruit and a hint of French oak spice round out the flavor. STAR: 2005 Two Hands Bella's Garden Barossa Valley Shiraz ($60) Two Hands, founded in 1999 by Australian wine-business veterans Michael Twelftree and Richard Mintz, has risen to superstar status on the strength of its broad range of wines, among them this inky, velvety, blackberry-rich Shiraz. STEAL: 2005 Grant Burge Barossa Vines Shiraz ($15) This red wine from fifth-generation Barossa producer Grant Burge, which shares a basic blackberry fruit character with the Two Hands, is friendly and direct—an all-fruit-all-the-time wine that gets to the heart of the appeal of Barossa Shiraz. STAR: 2005 Spring Valley Vineyard Uriah ($50) This Merlot blend is named for Spring Valley Vineyard cofounder Shari Derby's grandfather, who farmed in the area in the 1880s. 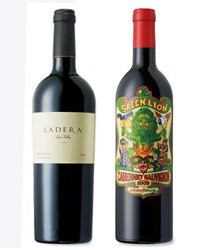 With its voluptuous chocolate-cherry flavors, it explains why wine lovers are so excited about Walla Walla Valley reds. STEAL: 2004 Powers Merlot ($13) Bright blackberry and blueberry fruit and a floral scent define this juicy but elegant Merlot. Though it's a lighter and less complex wine than Spring Valley's Uriah, winemaker Greg Powers helps add depth and intensity with a touch of Syrah (12 percent). STAR: 1987 R. López de Heredia Viña Tondonia Gran Reserva ($81) R. López de Heredia only releases its wines when it feels they are at the perfect age, like this gran reserva. Its sweet, dried-cherry fruit is deftly balanced against still-vibrant acidity, firm tannins and an extravagant, enveloping aroma. STEAL: 2003 Martínez Bujanda Conde de Valdemar Crianza ($14) This appealing Rioja shares the López de Heredia's cherry flavors, but here they're ripe, rather than dry, and somewhat modern in style. Yet they're not too ripe, and there's plenty of tannic structure to keep the wine in shape. STAR: 2004 Château de Beaucastel Châteauneuf-du-Pape ($99) The low-yielding 2004 vintage in the southern Rhône produced wines that are easy to drink young; even this smoky, meaty, black cherryrich 2004 Beaucastel, from one of the most famous producers of Châteauneuf. STEAL: 2005 Domaine Paul Autard Côtes-du-Rhône ($15) Jean-Paul Autard uses no pesticides or chemical fertilizers in his vineyard on the border of the Châteauneuf-du-Pape appellation, producing distinctive wines like this polished Côtes-du-Rhône, which shares Beaucastel's black cherry character. STAR: 2004 Château Pichon Longueville Comtesse de Lalande ($85) Pichon Longueville, a Second Growth in the 1855 Bordeaux Classification, makes wines nearly the equal of the more hallowed Firsts. Its 2004 bottling is impressively layered and rich with red currant and tobacco aromas. STEAL: 2003 Château Robin ($19) Though not nearly as subtle (nor as long-lived) as the Pichon, this bottling from the up-and-coming Côtes de Castillon region shares its red curranttobacco smoke notes. And it's actually more approachable right now, partly because it contains more Merlot. STAR: 2005 Sineann Phelps Creek ($42) Winemaker Peter Rosback owns Sineann, one of the best boutique wineries in Oregon. In '05, he made a range of stunning Pinot Noirs, including this one, from a vineyard in the Columbia Gorge region. It's full of intense wild blueberry and blackberry flavors. STEAL: 2005 O'Reilly's ($15) David O'Reilly, co-owner and winemaker at Oregon-Washington boutique producer Owen Roe (and a friend of Sineann's Rosback), makes a line of budget-oriented wines under his own name, like this lively '05 Pinot whose wild berry flavors hint at those of the Sineann.